The South Division Champs are at home 8/30-9/6. It's our last home stand of the 2010 season. We're playing division rivals Charlotte, Gwinnett and Norfolk across the week. Make the Bulls part of your Labor Day weekend. Fireworks on Friday and Saturday. The Monday holiday game is at 1:05. ...but that's not all: Our first play-off game at home will be Friday night, 9/10. Often, our play-off games fall during the week. It's great to have a Friday night game. 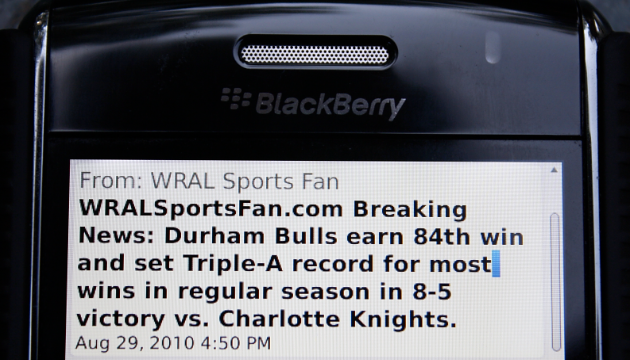 I'm looking forward to a BIG, LOUD Bull City crowd. Another 2011 date of import is Monday, May 9th. 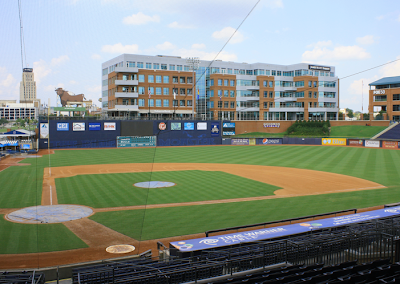 The Bulls will play a retro game at the storied Durham Athletic Park. Our 2010 return to the DAP was a tremendous success. 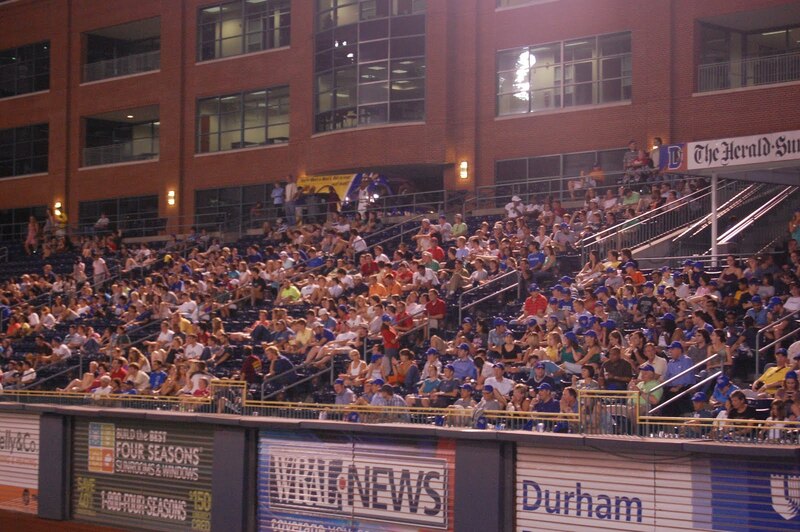 MiLB and the City of Durham encouraged us to make it an annual event. I was reluctant - thought it might lose its magic - but I came to my senses! 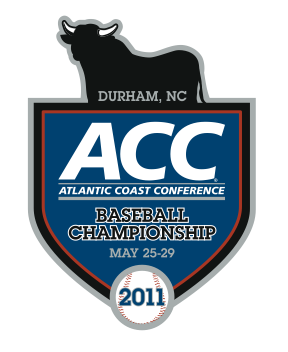 Click here for the news release about the DAP game and our 2011 schedule. Goodmon Field - resting comfortably - last Friday afternoon. 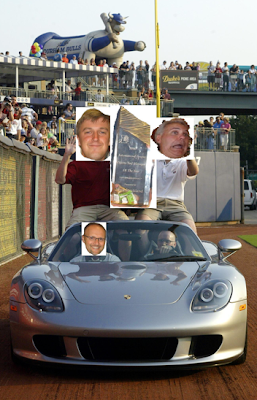 Front office humor: Scott deserves a parade! It's back to school this week, and that probably had an impact on our attendance Tuesday and Wednesday. There's an upside, though: We hosted the Duke freshman class on 8/25. 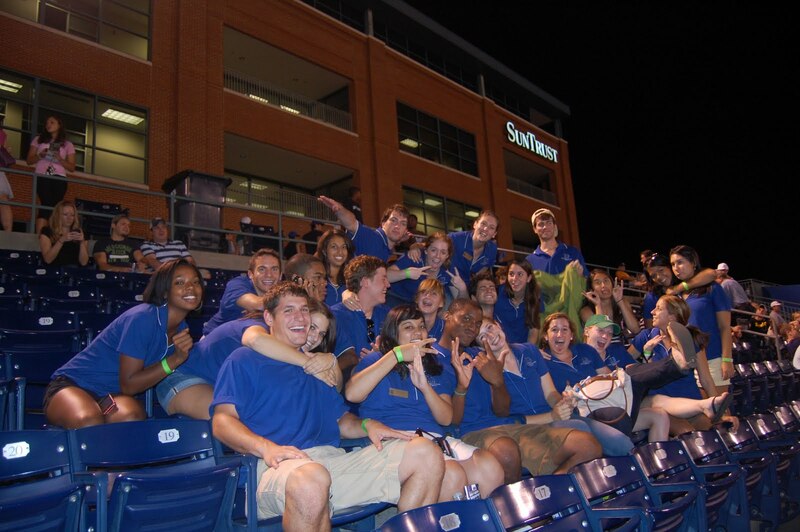 As part of their Durham orientation, the class of 2014 was invited to a Bulls game. An excellent way to begin one's higher education! 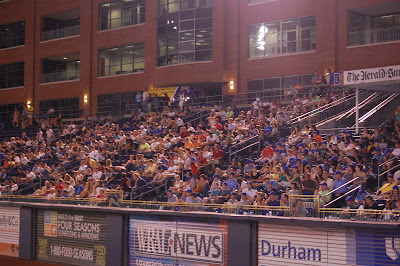 We had about 1200 Blue Devils dine at the American Tobacco Campus and attend the game. The freshman class totals 1,745 this year. 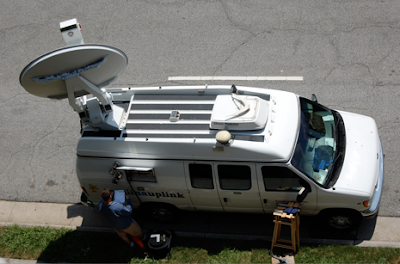 Duke received 27,000 applications. A select group. The combined GPA of Bulls patrons reached an all-time high Wednesday night! What are revered village elders wearing in Uganda these days? Durham Bulls caps, of course. 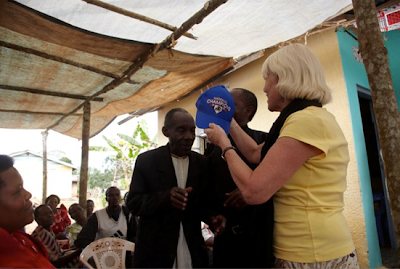 Winkie La Force, the intrepid Executive Director of Leadership Triangle, recently returned from another church trek to Africa. She always takes a box of Bulls shirts and caps. We're popular worldwide. 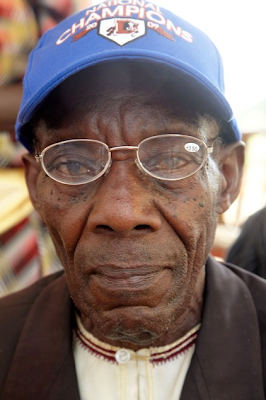 Notice the elder's new reading glasses. In addition to Bulls caps, folks in the village received specs from Mission Vision, a Davidson College-based organization founded by Winkie's nephew. LEADERSHIP runs in her family. We clinched our fourth consecutive South Division Championship Friday night...and two full weeks remain on the schedule! The Bulls are in a hurry to win that International League Governors Cup...maybe another Triple A National Championship!?! 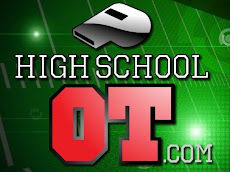 Click the link: Game story. Tickets. Jack Betts, Associate Editor of the Charlotte Observer, paid us a visit. Teresa Engebretsen sampled our garlic fries for the Durham Herald-Sun. 2/3rds of new job creation comes from businesses less than five years old. Seven out of ten jobs in our state are created and sustained by small business. Across the street at the American Tobacco campus they recently unveiled plans for a new workspace for entrepreneurs - the American Underground. It’s a clever and compelling use of basement real estate that allows for flex space and short-term leases…something that’s almost impossible to do with class A office space above ground. Also, the American Underground is designed for collaboration and shared services. In my last post on Mark Cuban’s visit to Durham, I noted his advice to entrepreneurs: keep your costs low; live like a college student. American Underground meets that need, but it will definitely be a cut above dorm life…a very cool work environment. 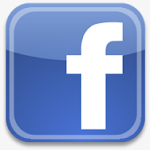 Check out the American Underground web site: CLICK HERE. 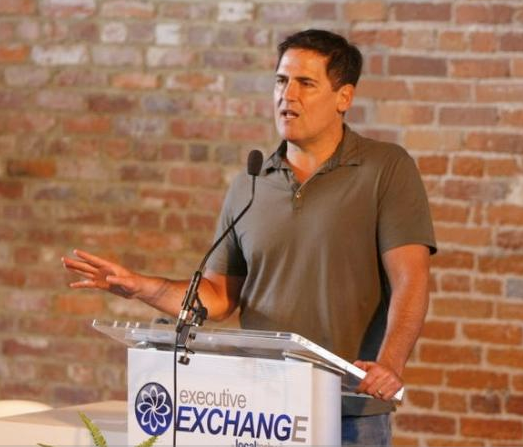 Mark Cuban paid a visit to Durham last Thursday. For the hi-tech set, it was like having Lady Gaga in town. The “dot com billionaire” was in the house! 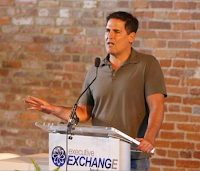 Cuban was the featured speaker at a day-long event hosted by Local Tech Wire (a Capitol Broadcasting Co. enterprise.) Check out their coverage: the photo gallery and a good story on Cuban’s rules for business. He spoke at Bay 7 to a packed house on the American Tobacco campus. Even though he is routinely introduced as a billionaire, Cuban is a thoroughly unpretentious guy. Accordingly, one of his rules for a start-up company: live like a college student...cheaply. And his advice to college grads is more of the same: live cheap, eschew credit cards, drive a clunker, endure multiple roommates…and try different jobs until you land upon something for which you have a passion. That may not be what every parent envisions for their new graduate…but hey…he is a billionaire. It certainly worked for him! Maybe I’ve gone astray blogging lately about rubber ducks, concerts, Boy Scouts and beer. Let’s get back to basics…baseball! 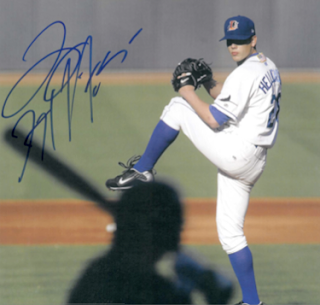 Jeremy Hellickson – most recently of the Durham Bulls – made his second Major League start Tuesday for the Rays. At Detroit, he gave up a mere three hits…and struck out seven…without walking one batter…during his seven innings on the mound. The Rays beat the Tigers 8-0. 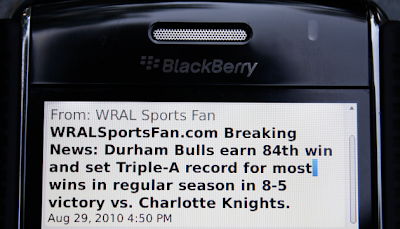 Hellickson, of course, has been a huge factor in the Bulls’ successful 2010 season…and he’s not quickly forgotten around the DBAP. You may want to scarf up a memento before your only recourse is an eBay auction. If you spend $75.00 in our Ballpark Corner store, you receive a collector’s bonus: a Jeremy Hellickson bobble head. And Jeremy signed a box of photos on his way to the airport. You can own one for $10.00 while supplies last. In the memorabilia biz, these are Blue Chip investments! Wanna buy a duck? That’s a famous vaudeville era line, and it's thoroughly appropriate for the fall of 2010. 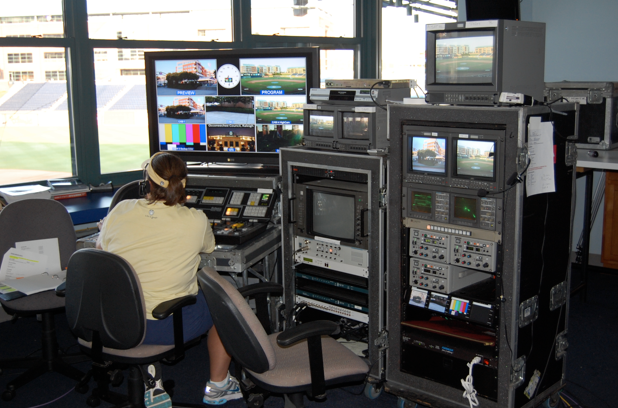 The Bulls, Fox50 TV and Capitol Broadcasting Company have recently established a scholarship program at the Triangle Community Foundation for Post 50 seniors. We seeded the fund with $10K. Now, the students are adding to the principle, and ducks are performing better than many investment alternatives! 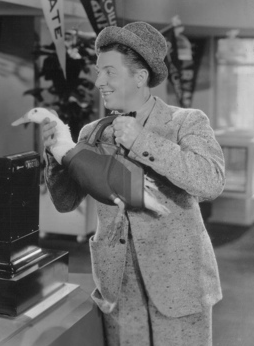 …so buy a duck, please, and mark October 2nd on your calendar. Watch the ducks paddle down the Old Bull River in the American Tobacco campus courtyard. It’s part of the Fox50 FamilyFest - an afternoon of live music, games, food and fun in downtown Durham. The Boy Scouts have just completed a gigantic conclave at Fort AP Hill in northern Virginia. 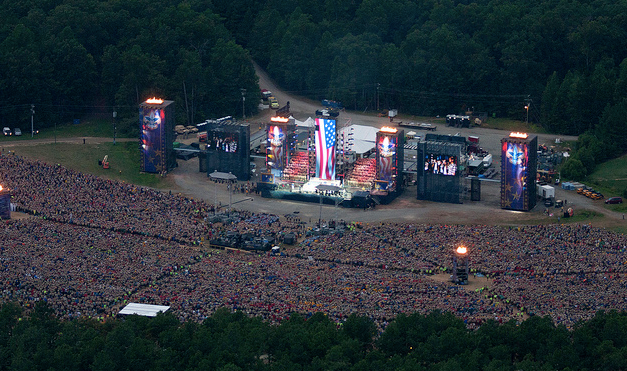 45,000 scouts and adult leaders gathered for ten days at their National Scout Jamboree - celebrating 100 years of the scouting movement. 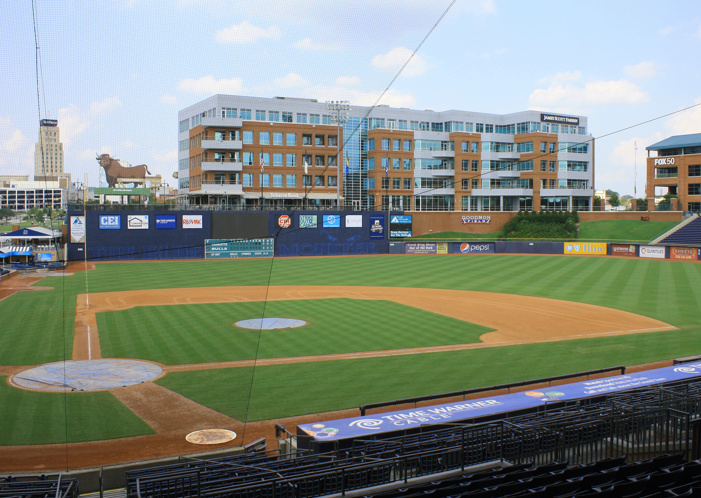 The Durham Bulls played a modest role for the local Occoneechee Council. 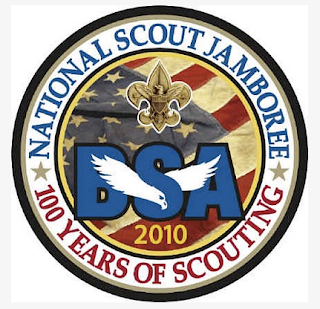 Last Saturday night we turned our video screen into a huge television, and 400 local scouts watched the Centennial Celebration (via satellite) themed "Shining Light Across America." Blue Cross & Blue Shield of NC sponsored the DBAP event. Durham and five other US sites were selected for the Jambo Simulcast...catchy name! Actually, the scouts did more than watch. They participated. There was a live camera trained on the scouts in Durham. Images of our scouts at the DBAP were beamed to a video screen on the stage at the National Scout Jamboree. As I have mentioned before, the Bulls sponsor an Explorer Post through the Occoneechee Council. These young folks - about 75 active members - produce our in-house video and television broadcasts. They are raising money for a new college scholarship program in a novel way; check it out...click here. Bullpen Pale Ale is crisp and mellow, with a soft maltiness, balanced with a flavorful American hop character. This deep golden ale is the perfect thirst quenching complement to a day at the ballpark. 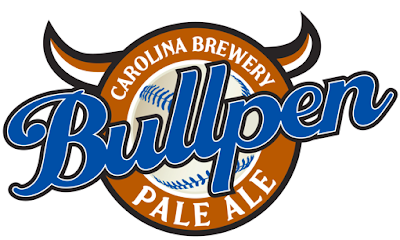 Bullpen Pale Ale - created by Carolina Brewery for the DBAP - is catching on and branching out across the Triangle.